Remember the cardigan I was making for my BFF Jess but it ended up my size in some weird way? 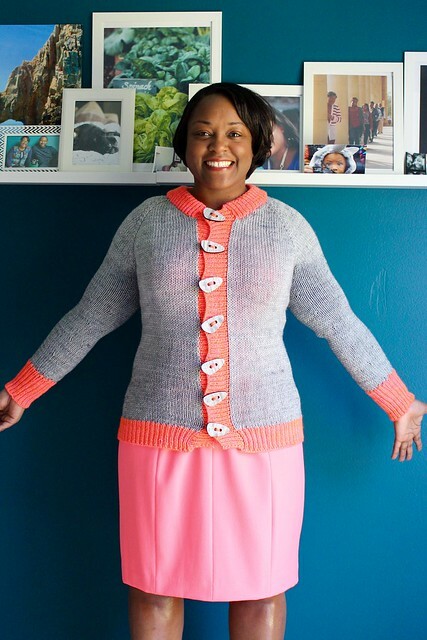 Well, here’s my Cracked Pepper cardigan…ta-da! For the body of the sweater I used a little less than 2 skeins of Neighborhood Fiber Co studio worsted in Charles Centre, a lovely grey. I love this yarn, I really do. Their site says it’s worsted but it’s really a light worsted/dk weight and it created a lovely fabric with a lovely drape to it when you knit with size 10 needles. The ribbing and bands are done in Madelinetosh Tosh Merino DK in the neon peach colorway. I had almost 2 full skeins leftover from my Comfort Cardigan project and was holding on to it for something fun. 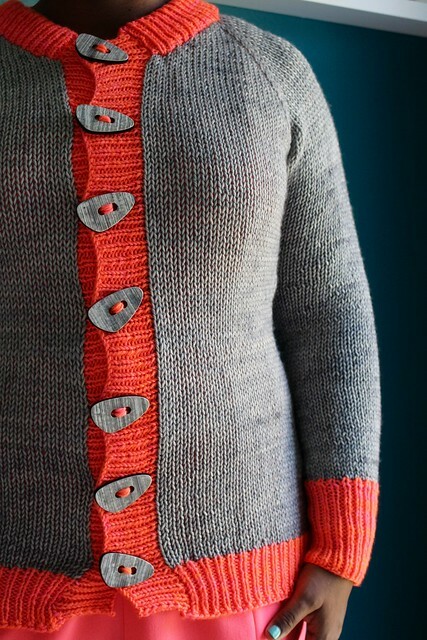 And the best part of this cardigan (in my opinion) are the buttons and I picked them up on my lunch break Friday at Looped Yarn Works in DC. I also bought some see through peach buttons but they just faded into the button band and I decided to go big and bold with the buttons just like I did with the neon peach. I was on gauge and followed the pattern completely for the smallest size and yet somehow it came out fitting me, a size that’s typically large in knitting patterns. I felt so guilty for it not working out for my BFF but Jess wasn’t bothered and I know it’s not a big deal but I was just disappointed. But her loss has now become my gain. I also know if I wasn’t super lazy in my blocking and pinned the edges of the button band they’d be perfectly straight…but I was being lazy and I can live with how they look. 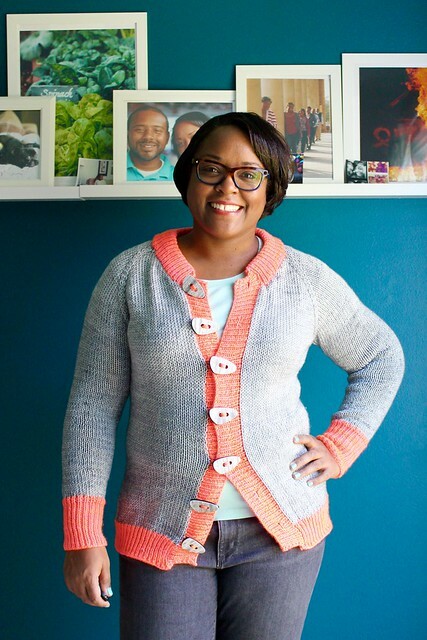 I also wanted to show the three ways I’d actually wear this cardigan since I know the crazy bright color with the neutral throws some folks off. Also, hand on my hip is my signature pose 😉 Plus, I typically hate the styling in knitting magazines (Who tucks a sweater into slacks and puts suspenders over it? I’m talking to you, Intervweave Knits Spring issue). Plus I know a lot of people only think of wearing their knit sweaters over jeans and that’s cool but there are other options too! The top picture is actually what I’m wearing to work today. I’m pretty much wearing neutrals with a navy and white dress, navy tights and clog boots and ironically the zipper on the back of my dress is bright coral – so I figured why not throw this on as a layer since it’s a sleeveless dress? 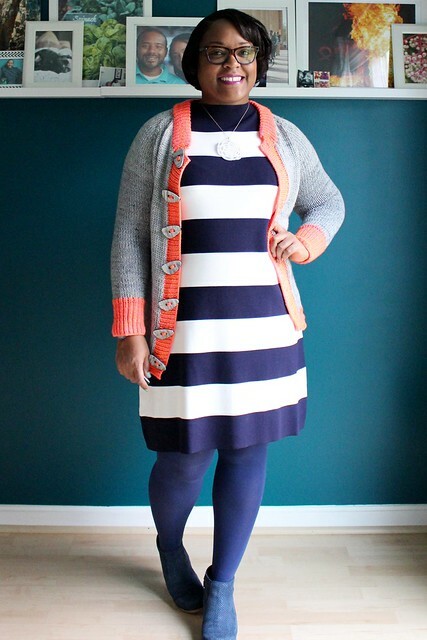 Totally works and adds a nice punch of color to a neutral outfit. For the more casual look, I paired it with my light grey jeans but added a light seafoam green shirt underneath. I like pairing the pastels with the vivid neon and will probably do this a lot on the weekends with this cardigan (did I mention how cozy it is?). And then for the last look if you want to go tone on tone, I’ve got a crazy bright shift dress and I buttoned the buttons all the way up over the dress so you could see it buttoned up but also see it styled a bit more seriously. Three different ways and three different color palettes but they all work! 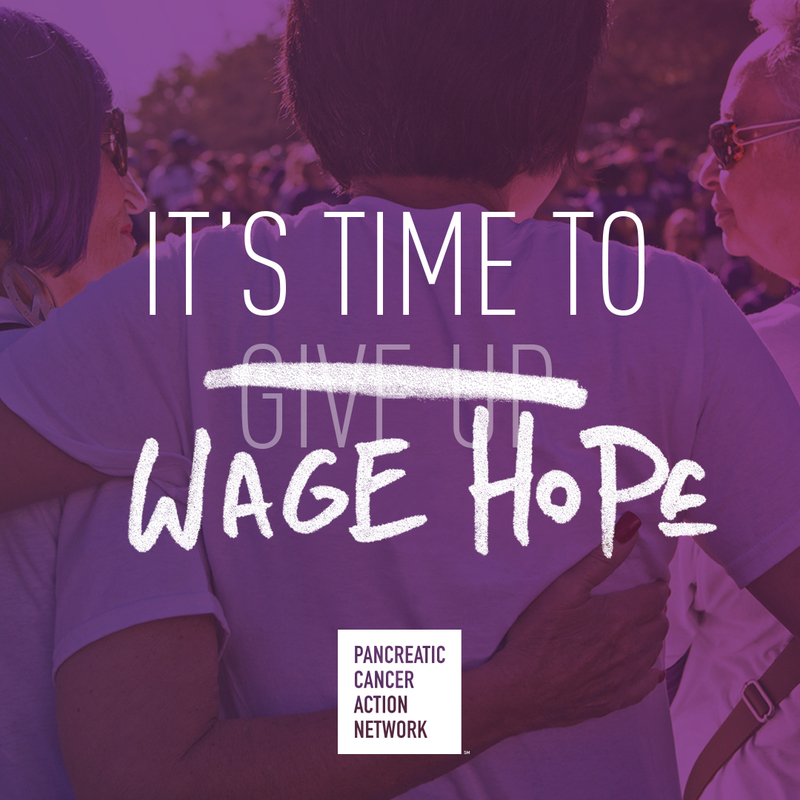 And the possibilities are endless. So also this project did not turn out as expected it still turned out to be a winner. You learn something new every time you knit a new project, right? So tell me, what’s on your needles right now? 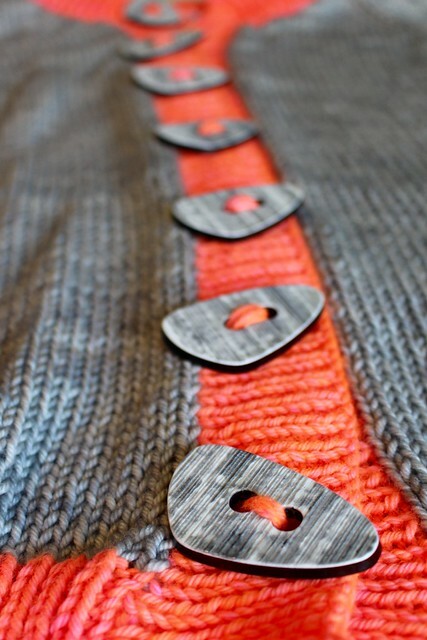 Yeah the buttons kind of make the sweater. It’s all in the details. It’s nice and cozy. If only it fit my intended person but her loss is my gain!